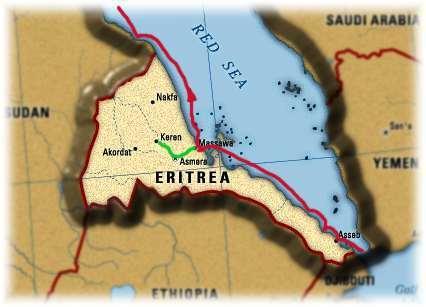 Eritrea sits in one of the world’s most strategic locations. AFRICANGLOBE – Israel has completed the construction of its largest listening post in the Red Sea Basin in efforts to monitor the movement of the Arab coalition involved in the Yemen conflict according to reports. According to the Palestinian Information Centre, the post is located on the Emba Soira, the highest mountain in Eritrea. Expert of East African affairs Usama al-Ashqar said that the post’s existence was confirmed by the Eritrean opposition and is aimed at observing Bab al-Mandab Strait and areas of Israeli interests in the south of the Red Sea, namely the movement of its commercial ships. He also said that the post will observe the movement of the Arab coalition involved in Yemen and Iranian activities in the sea in the wake of building up its relations with Eritrea following the cut of diplomatic ties with Sudan. It is also aimed at analysing the sea and air movements in the south of the Red Sea as the Arab coalition is hiring an Eritrean seaport for logistic emergencies.